Business Wire: MIPI Alliance introduces CSI-2 v1.3, an update to its Camera Serial Interface (CSI) spec. The new interface operates CSI-2 on either of two physical layer specs: D-PHY, which CSI-2 has used traditionally, as well as MIPI C-PHY, a new PHY that MIPI Alliance released as v1.0 in September 2014. Products may implement CSI-2 solutions using either or both PHYs in the same design. 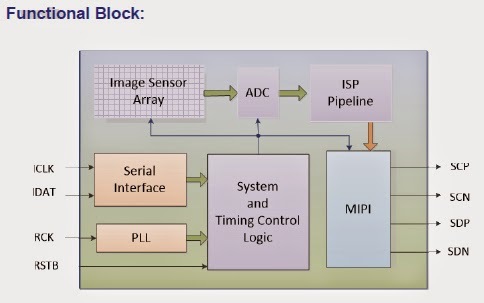 MIPI C-PHY uses 3-phase symbol encoding of about 2.28 bits per symbol to transmit data symbols on 3-wire lanes, or “trios,” with embedded clocking, facilitating longer trace reach and maximizing camera port configurations on mobile platforms. MIPI CSI-2 v1.3 with C-PHY provides performance gains, increased bandwidth delivery of 22.7 Gbps over four lanes at 2.5 Gsps (Giga-symbols per second) for realizing higher resolution, better color depth, and higher frame rates on image sensors while providing pin compatibility with MIPI D-PHY. Popular imaging formats including 4K video at 30fps using 12 bits per pixel may be delivered using a single MIPI C-PHY lane. CSI-2 with D-PHY v1.2 can achieve a peak transmission rate of 2.5 Gbps over a single lane or 10 Gbps over four lanes. 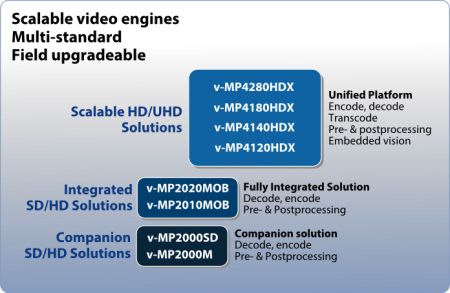 A 12bpp, 30 FPS 4K video can be transmitted using two data lanes. Sony announces 4 new image sensors. IMX290LQR and IMX291LQR are 1/2.8-inch, 2.3MP 2.9um BSI pixel CMOS sensors featuring an improved IR sensitivity and WDR modes. The new 2.9 µm BSI pixel is said to provide two or more times the sensitivity in the visible-light region and three or more times the sensitivity in the NIR region than that of the existing Sony product (IMX236LQJ). In addition, two types of WDR are provided: IMX290LQR has multiple exposure and DOL (Digital Overlap) -WDR function, while IMX291LQR has only multiple exposure WDR. The multiple exposure-type WDR outputs one set of two or four frames with different exposure times. 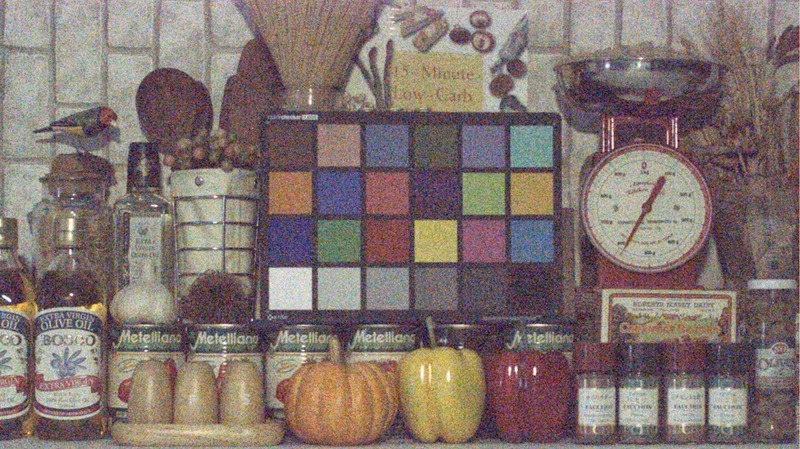 The gain can also be set separately for each frame in addition to the exposure time. The DOL-type WDR function outputs the data for up to three frames with different storage times line by line. 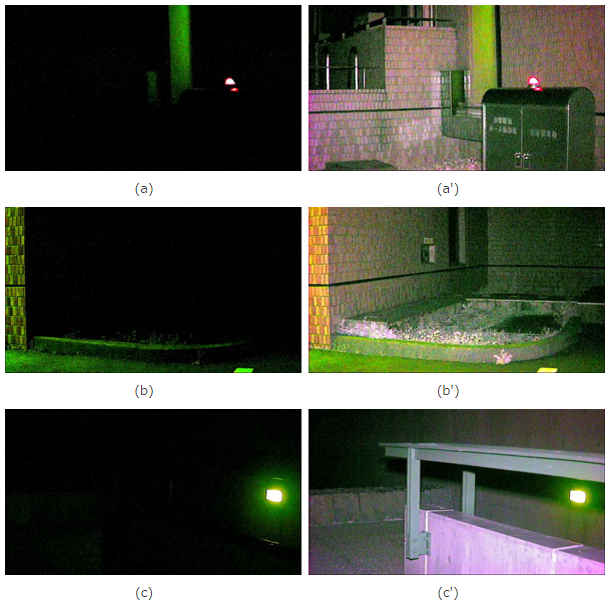 By performing special signal processing with an ISP or other device at the image sensor rear-end, this is said to improve the picture quality under low illumination compared to the multiple exposure-type WDR function. 2.35MP IMX302LQJ is yet another member of 5.86um pixel-based global shutter sensor (Pregius) aimed to industrial and machine vision market. The sensor's speed is 64.1fps with 12b ADC. Update: Talking about Sony global shutter sensors, IMV Europe quotes Thad Smith, director of business for image sensor products at ON Semiconductor: "IMX174 can indeed be considered a disruptive technology. The technology demonstrates the possibilities of the new charge-based pixel approach and sets a new benchmark for image quality. However, while IMX174 is a single part in the portfolio, On Semiconductor’s image sensors offer a larger range of solutions for the industrial market. This is a key differentiator." 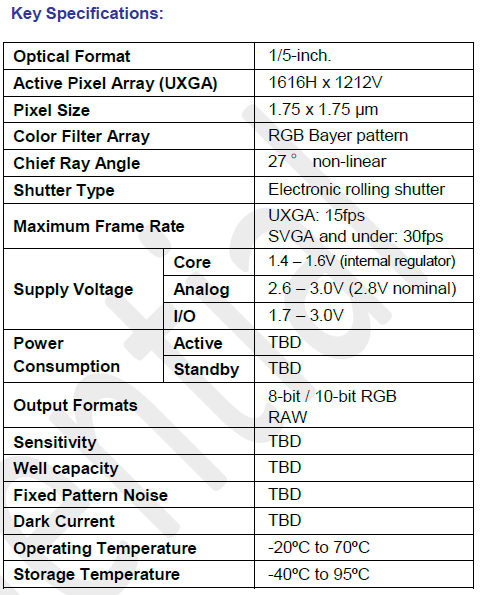 In recent months, Sony appears to release quite a few IMX174 derivatives featuring the same 5.86um global shutter pixels. And there is a 2nd generation of its global shutter pixel coming. 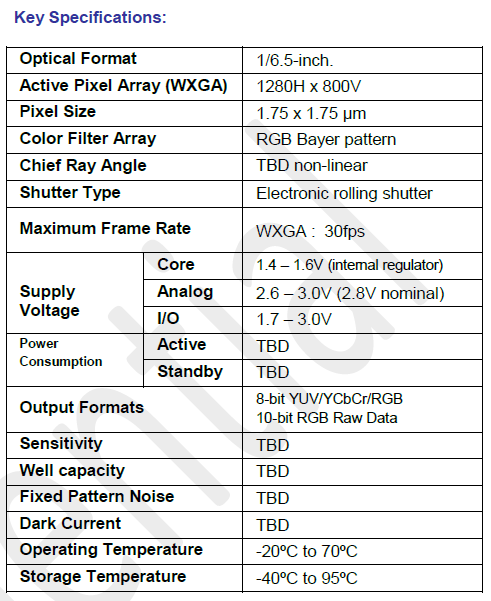 Update: For some reason, as of Feb. 21, 2015, Sony has withdrawn the ICX816AQG CCD announcement. The links to it are broken. PR Newswire: OmniVision is collaborating with Almalence to bring DSC-like performance to mobile applications. 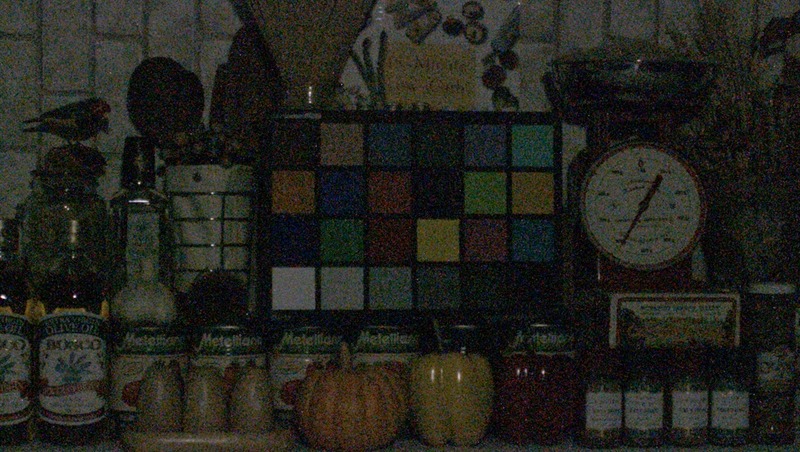 The coupling of 10MP OV10823 and 13MP PureCel OV13850 image sensors with Almalence's computational imaging algorithms allows for the capturing of high resolution images or videos in low-light conditions. 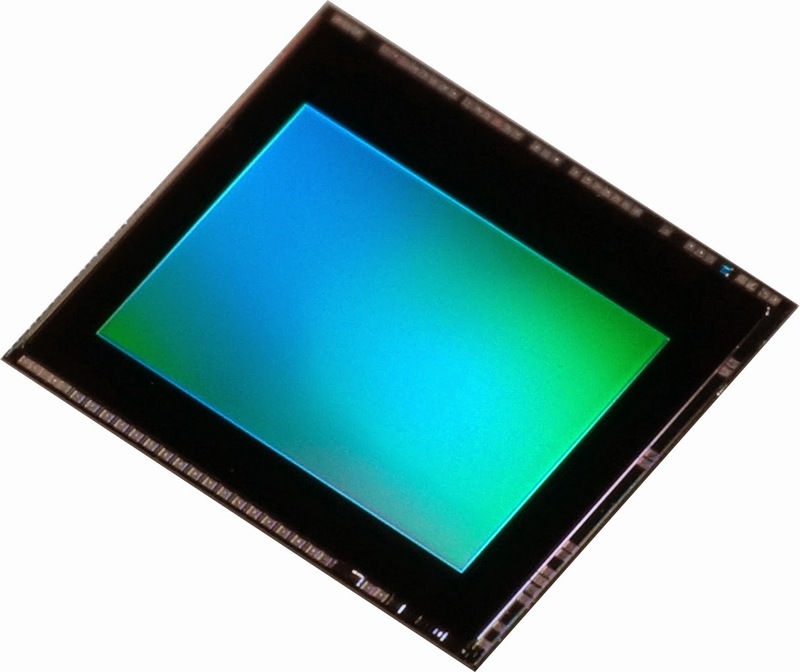 "When using Almalence's algorithms, our high performance OV13850 PureCel image sensor can enable high quality video recording in full resolution at 30 frames per second for zero shutter lag, and also can support high frame rate 1080p HD video at 60 frames per second with electronic image stabilization," said Tehzeeb Gunja, senior partnership and business development manager at OmniVision. 1.4um OmniBSI-2 pixel OV10823 performance is augmented by Almalence's low-light enhancement technology, which can enable 10dB reduction in noise without washing out desirable image details. Cameras using super resolution can experience a 1.5 to 2x effective resolution increase. Almalence's super resolution and low-light enhancement technologies are pure software solutions. "As a result of this technology partnership between Almalence and OmniVision, consumers can benefit from the advantages of marrying advanced hardware and software solutions," said Eugene Panich, CEO of Almalence. 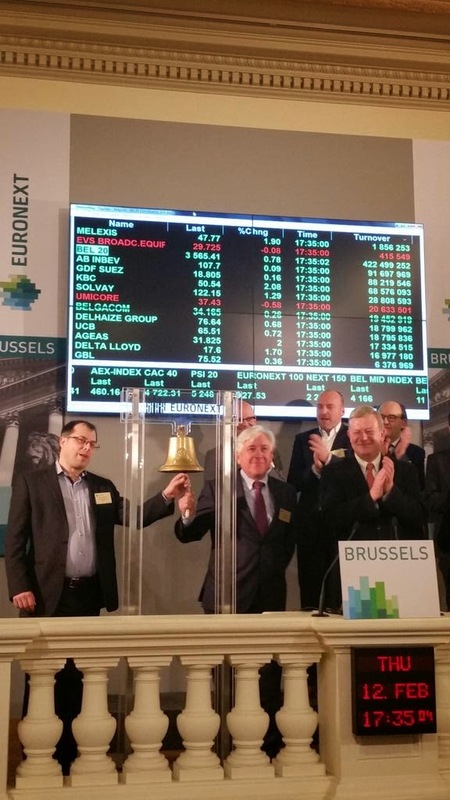 "Our companies have developed complementary technologies and our passions are very much aligned. We are delighted to see our computational imaging solution paired with image sensors that operate at this level of performance." Sony mid-term corporate strategy for FY2015-17 declares its image sensor business one of the main growth drivers. "In Devices, Sony aims to further bolster its competitive edge in the area of CMOS image sensors by investing to increase production capacity and enhance R&D." Qualcomm Snapdragon blog presents few camera features implemented in its recent ISP pipeline. The presented features exploit modern sensors ability of taking few snapshots in a quick succession, and use it for flash and no-flash images combination, all in focus feature, and ghost-free HDR imaging. A new Optizoom feature is supposed to rival the optical zoom quality "by capturing 12 images in a burst capture, and then creating a sharper image by comparing the differences and similarities in the micro movements of the pixels you’ve captured:"
Financial Times: Sony owns about 40% market share in CMOS sensors for smartphones, digital cameras and tablets, followed by roughly 16% share of OmniVision and 16% share of Samsung, according to 2014 TSR report. But Sony only ranks fifth with a 5% share in automotive image sensors. Shigeo Ohba, GM of Sony’s image sensor business, said "We have to be No 1 in automotive sensors" by the time self-driving cars are expected to hit the roads in early to mid-2020s. Recently, Sony established a new business group targeting image sensors for cars and is actively hiring engineers. “We were latecomers in smartphone cameras but we still created this market. 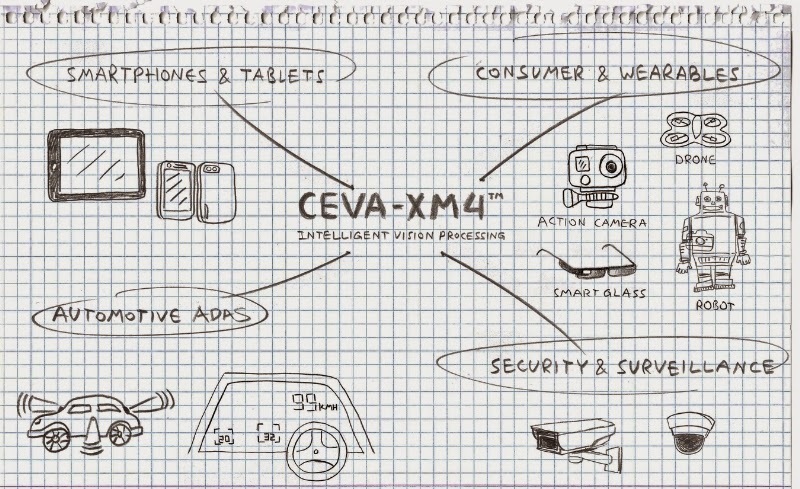 Now we can do the same with automotive cameras,” said Shoichi Kitayama, Sony’s GM of the automotive group. Sony CEO Kazuo Hirai is expected to disclose his automotive image sensor plans on the strategy briefing on Wednesday. "We’ve been engaged in Ara program for more than a year now. Engagement started because of Toshiba’s involvement in the standards committee of MIPI UniPro, and UniPro is a backbone of the Ara phone. So we know UniPro very well. To make developers life easier we developed bridges (two types of bridges and the switch chip), so module developers can use those chips and they don’t need to learn about complexity of UniPro protocol." "The degradation comes from plasma-based treatments used during the treatments of the back side of the sensor, particularly for forming the back side metallic contact pads, of aluminum for example, and for forming the layer protecting the colored filters, which aims to protect these filters during the slicing of the sensors along the slicing lines of the semiconductor wafer. More precisely, the plasma charges the silicon oxide-silicon nitride stack triggering a trapping of positive charges (holes) in the anti-reflective silicon nitride layer, holes which will then migrate to the interface with the substrate to create a dark current by recombination with electrons." In order to reduce the dark current, the application proposes: "an additional layer situated above the anti-reflective layer and including at least a lower part containing hydrogenated amorphous silicon (a-Si:H) or hydrogenated amorphous silicon nitride (a-SiNx:H), in which the Si/N ratio of the number of silicon atoms per cubic centimeter to the number of nitrogen atoms per cubic centimeter is greater than 0.7, and preferably greater than or equal to 1.2. The function of this additional layer is to absorb, or even to stop, ultraviolet radiation, and/or to evacuate the trapped charges in the anti-reflective layer during subsequent plasma treatments, which will therefore reduce the residual positive charges possibly trapped in the anti-reflective layer and consequently reduce the dark current. The thickness of this lower part of the additional layer is preferably less than a few tens of nanometers, for example a hundred nanometers, or even less than ten nanometers." The pixel is split into 2 layers: "a buried light shield 710 separates the sensing layer 702 into a first substrate layer 738 and a second substrate layer 740. 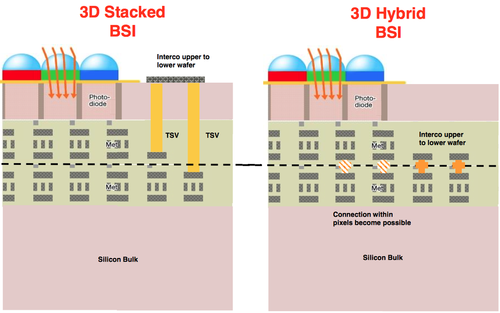 The sense region 716, the storage region 712, and the pixel transistors can be in the second substrate layer 740 while the photodetector 708 resides in the first substrate layer 738. The buried light shield 710 prevents unwanted charge accumulation in the storage region 712 and in the sense region 716." The vertical transfer gate 714 is made of poly in the trench and has a contact pad 718. 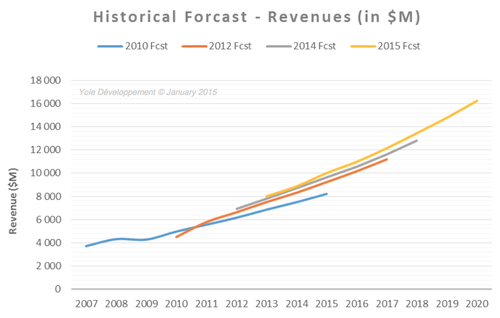 Himax reports its 2014 business results: "Revenues from CMOS image sensors also experienced significant growth in 2014 and should continue to be a fast growing product area for Himax in 2015. Sales of the Company’s 2 and 5 megapixel products were particularly strong, mainly due to robust demand from several international customers as well as from Chinese white-box customers. Looking into 2015, Himax expects its sales of 8-megapixel sensors, now the mainstream design for smartphones, to accelerate while high end 13 megapixel sensors to start mass production later in the year. This puts Himax firmly on the map as one of a small handful of companies capable of offering a comprehensive product portfolio for smartphone cameras. In addition to the a fore-mentioned consumer applications, Himax is also making significant progress in CMOS image sensors for non-consumer applications, which typically enjoy higher margins and have relatively little direct competition. Himax already started initial shipments to a Korean automotive end customer and is actively engaging more module houses to penetrate into Chinese before-market-installation automotive applications. As the Company grows sensor sales for automotive and other non-consumer applications and continues to turn the bulk of its CMOS image sensor sales from 2 and 5 megapixels to higher end, higher margin 8 and 13 megapixels, Himax expects its CMOS image sensor business to accelerate in 2015." "CMOS Image sensor sales nearly doubled year over year." "Furthermore, the Company continues to partner with numerous industry leading companies using its cutting edge and industry-dominant wafer level optics, or WLO, for the development of ...technologies of the future, namely array cameras. ...To meet the anticipated demand growth for its LCOS and WLO products, the Company is expanding its production capacity starting in Q1 2015." DPReview: Canon exhibits 120MP, 2.2um pixel image sensor prototype at CP+ photography expo in Yokohama, Japan. To boost the sensor speed, Canon utilizes "parallel processing, which reads signals at high speed from multiple pixels." 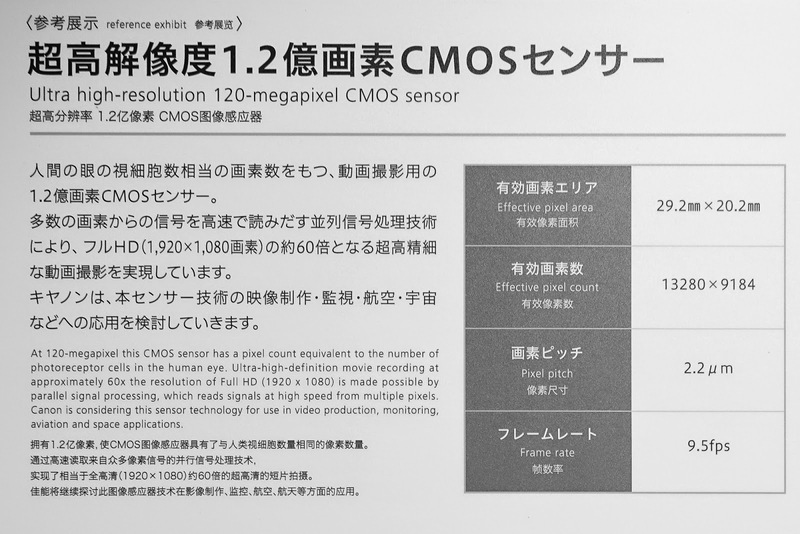 It seems to be the same sensor that Canon announced 4.5 years ago (see the official announcement here).